We all have that one area. That one spot in the carpet that’s always there. You know the one: a little discoloration, a splotch, a patch, just a little bit different from the rest of the floor. Maybe you’ve even tried to clean it, but, like a winter cold, you just can’t seem to shake it. 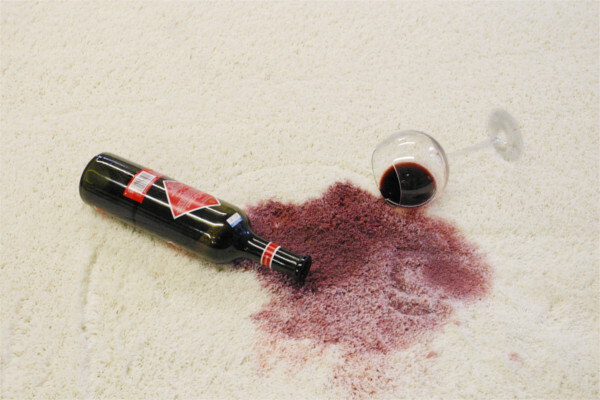 That carpet stain keeps coming back no matter what you do. What do you do with carpet spots that just won’t go away? After 4+ decades of cleaning experience, our expert Modtechs have identified the 3 main reasons carpet spots keep reappearing. There’s one thing we need to clarify first – the difference between a stain and a spot. Colloquially, they’re used interchangeably; we often refer to spots as stains and stains as spots in casual conversation, but did you know they have distinct definitions? In the professional world of carpet cleaning, a spot is the substance of whatever is on your carpet: a food spot, coffee spot, a dirt spot. The material you can see on your carpet makes a spot, and spots are almost always removable. A stain, however, is generally more permanent. When carpet gets stained, dyes from the substance (the spot) are transferred into the fibers, changing their color. Sometimes this can be reversed to a degree, but dye transference actively changes the coloring of the fibers – meaning the original color has been altered and makes it very unlikely it will be able to get back to its exact shade. That’s why we don’t like to call something a stain unless we know for sure that the fibers have been dyed! The Problem: If you’ve used an over-the-counter spot cleaner, chances are it worked pretty well – at first, anyway. Many carpet cleaning products available on grocery store shelves contain some kind of soap, which, in theory, sounds like it should be a good thing for your carpet spots. Unfortunately, the residue that soap-based products leave behind actually ends up collecting more dirt over time! Areas cleaned with soap will inevitably attract new dirt and soil at a much faster rate than the surrounding carpet – which makes it look like the spot is coming back! In reality, it’s a new spot created by soap residue. Gross! Why does cleaning carpet with soap end up attracting more dirt? Not to get too technical, but soap is made up of molecules that are both hydrophobic (attracts oils) and hydrophilic (attracts water). Having these seemingly opposite molecules is why soap mixes so well with both oil and water, making it very easy to draw up soil (and other substances) from your carpet. Unfortunately, its oil-attracting properties means any leftover residue is going to continue to attract oil, dirt, grease, and other particulate – meaning it gets dirtier faster in that area. Not cool, over-the-counter carpet cleaner! The Solution: Don’t use over-the-counter carpet cleaning products! They almost always cause more problems down the line. Instead, check out our handy stain solution guide for common household spots. All natural beats all chemical any day! The Problem: Another common reason for reappearing carpet spots is what we call the wickback effect. We see this a lot in spots with a LOT of substance – large liquid spills and large dog pet spots especially. What happens is that the liquid will soak through the fibers, through the jute backing, and into the padding beneath the carpet. Since carpet padding is so absorbent, the spot that you can see on the surface of the carpet, much like an iceberg, may be several times larger down in the padding. After a cleaning, as the carpet dries, it wicks up the spot liquid from the saturated padding into the dry carpet, drawing up the substance and making the spot reappear on the surface (sometimes even larger than the original spot!). The Solution: Prevention! Blot up large liquid spills as soon as possible before they have a chance to soak into the padding. 3M Scotchgard is a fantastic way to help your carpet fibers repel liquid and give you more time to clean up after a spill. If the spill already happened and the pad is saturated: Have a professional deal with it! A truck-mounted hot water extraction machine and an expert Modtech have the power and knowledge to deal with deep-down spots! The Problem: One of the most obvious reasons a carpet spot keeps reappearing is also one of the most frustrating: your pet has chosen a particular area in which to “do its business”. Even though you clean up the mess each and every time (and you can’t see it anymore), your pet continues to go back to the same area. Not fun! The Solution: The problem is smell. The odor remains, leading Fido to go in the same area time and time again. You need to get rid of the smell! Fortunately, we have a variety of pet-specific odor neutralizers that will dissuade pets from using the same area – and leave your home smelling great again. Modernistic has been permanently removing carpet spots in Michigan since 1973! When it comes to problem spots you just can’t seem to get rid of, trust the carpet cleaning experts! Call or click today. Life happens! No matter the preventative measure put in place, stains can happen too. We know you don’t always have the time to schedule a professional cleaning to deal with unexpected spots, so we decided to put together a simple guide to help you deal with the most common carpet stains. With this guide you can manage these stains until you get a chance to schedule a cleaning with a professional carpet cleaner. Important Note: This is only a guide! 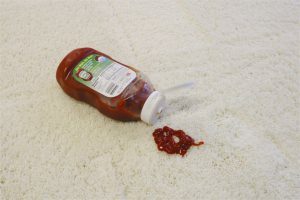 There is no guaranteed DIY method to remove all carpet stains, since there are many other variables that determine whether or not it will come out. You should always consult a professional before attempting to treat any stain at home! With a red wine spill or a coffee spill, you will want to address the mess sooner rather than later. The longer it sits the harder it will be to remove the stain! You will want to first blot up the excess liquid. Use either white terry cloth towels or paper towels. Now this is very important: Blot, don’t rub! The action of blotting picks up excess liquid, so it will not saturate the carpet fibers or pad further. If you rub the area, the liquid will spread and get worked into the fibers, and the stain will be much harder to remove. Once you have blotted up the excess liquid you will want to get at least 2 fresh clean towels to work with and mix a bowl of cleaning solution. The cleaning solution will be 1 part sugar free club soda and 1 part cold water, mix it well! Dab the solution onto the stained area to saturate the stained area with the cleaning solution. Then, using the dry towel, you will blot the stained area to lift up the cleaning solution. Repeat this process until you begin to see color on the towels you are blotting with. That means the stain is lifting off or the carpet. Continue the process of dabbing on the cleaning solution and blotting it up with a clean dry towel until you begin to see the color of the stain fade. It may take some time to see the color transfer, but do not give up! And remember, do not rub or the stain will get worse! 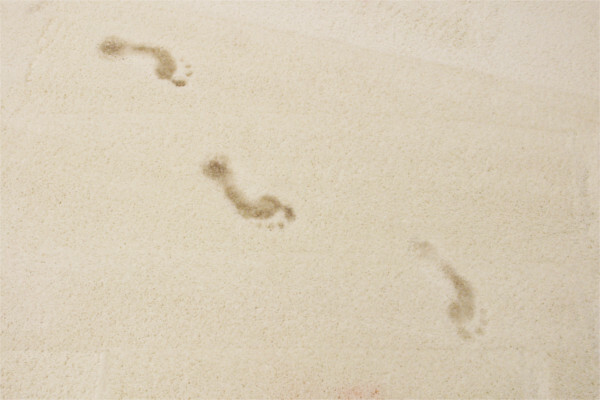 When dealing with muddy footprints on carpet you will have to do something that feels very unnatural….you will have to walk away and leave them alone to fully dry. Trying to clean the stained area before allowing the dirt to dry up and removing it will only exacerbate the problem. So, it may feel weird, it may be uncomfortable, it may go against all of your instincts to do so, but you will leave the muddy footprints alone until they fully dry. Once the footprints have dried try to remove as many large clumps of dirt as possible. Just pick them up with your hands and throw them out. Once you have removed all the larger chunks use the vacuum to pick up the rest of the dried dirt. With all the dry dirt and soil removed you will have a much clearer view of the stains you are dealing with. Grab a good amount of towels, either white terry cloth or paper, and mix your cleaning solution of 1 part white vinegar and 1 part cold water. Saturate one towel with this solution and dab it onto the footprint stain, then, using a dry towel, try to blot up the cleaning solution you applied. Continue this process of dabbing on the solution and blotting it up until you begin to see the dirt lift from the carpet fibers onto the towel you are blotting with. You may have to repeat this several times per footprint for the dirt to begin to lift. Remember: Do not rub! Only blot! With any type of blood spot you will want to treat the stain ASAP to reduce the chance of the stain. Dab up as much material as you can. Then make a mixture of sugar free club soda and cold water. The water must not be hot or warm, since blood coagulates if it warms and will stick to the fibers even more than before. Cold water is necessary to loosen the material and the stain is much more likely to release if you use cold water. As with the previous stains, you will dab on the cleaning mixture with one towel, then blot it up with another clean and dry towel. Repeat this process until the blood spot begins to lift from the carpet and onto the towel. Remember to take your time and to blot, not rub!! With pet stains odor is usually a factor. The best solution for dealing with pet stains is a 1 parts vinegar to 3 part water solution because the vinegar helps reduce any odors. It also helps release color, which is usually present in pet stains. Just like with the other stains above, you will first want to remove by hand or blot up as much material as possible. Once as much loose material as possible is removed begin to dab the cleaning solution onto the area to saturate the affected fibers, then use a clean and dry towel to blot up the solution. Repeat this process until the color begins to transfer from the carpet to the towel. As you repeat the process the strength of the odor should be reducing as well. Continue until the color has lifted. Now, there are still some spots or stains that will require a professional cleaning to truly remove, but these solutions will help you out in between Modernistic appointments. Maintaining your carpet with regular professional cleanings can really help protect your investment. If you have a household that has a lot of foot traffic, children, or pets you may want to ask your Modtechs about 3M Scotchgard protection. 3m Scotchgard creates a protective layer between your carpet and the world that is trying to stain it! When you have 3M Scotchgard applied, liquids will bead up on the surface of the fibers of your carpet and you’ll have time to blot up a spill before it saturates the carpet. Even if a stain does manage to work its way into the fibers, carpet with 3M Scotchgard protection has a higher likelihood of releasing stains during your next cleaning. 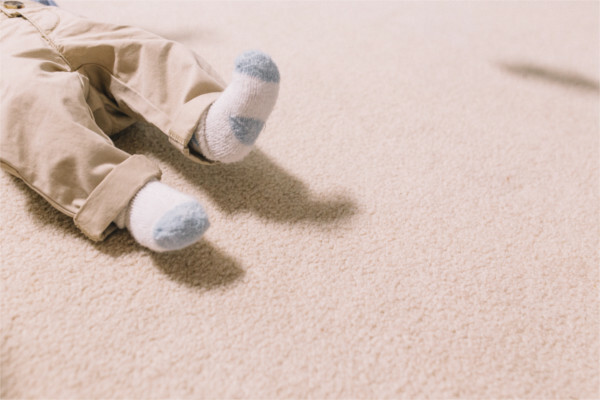 Now there are still some spots or stains that will require a truck-mounted hot water extraction system to truly remove, but these Simple & Quick ways to treat the most common carpet stains will help you out in between Modernistic cleanings! Modernistic has been cleaning up stains throughout Michigan since 1973, and you can trust we’ll get the job done right! Call or click today for help with your most stubborn carpet spots. Pet accidents, food spills, dirty feet, you name it; there are a multitude of bad odors that can leave your carpet smelling less than pleasant. Regular vacuuming sometimes isn’t enough to keep the odors at bay, and there comes a time in every carpet’s life that requires some odor intervention! Luckily, there are many different levels of carpet deodorization available to handle all your smelly carpet needs. The most basic deodorizing option is topical. This is when a carpet cleaning technician applies a spray on deodorizer post-cleaning. These commercial products, in addition to smelling nice, actually break down odor-causing molecules. This works great for odors that weren’t caused by a large amount of liquid. The next level of deodorization is submersion. This is ideal for carpeting when you know the issue is coming from a specific spot (ex: a pet continues to use the restroom in same area). The technician will essentially flood the area with the deodorizer and then extract it back out. This allows the cleaning technician to pull the odor out from the padding underneath the carpet. In tandem with this is the injection method of deodorizer for upholstery. The technician will inject deodorizer right into the affected area of the furniture and then pull it back out with their cleaning tool. If the odor issues in your home have gone into the pad but aren’t contained to just one or a few areas, it might be the time to consider pad replacement. A flooring technician can pull the carpeting back, replace the pad underneath with brand new padding, and then lay the carpeting back down. Finally give the carpet a professional cleaning and the room can be good as new! When you are replacing the pad, upon removal inspect the floor underneath. If the moisture was prevalent enough it could have damaged the flooring itself. This can cause further odor issues and weaken the flooring. If this is the case this would be the best time to replace the flooring. The treatments listed above work great for odors that are on your carpet or upholstery but what about if the smell is coming from the entire room? Removing the smell of smoke from a fire or decades of smoking is an example where cleaning the carpeting might not be enough. There are two more treatments that Modernistic offers to help in these more serious circumstances, the first of which is fogging. This is a machine that would be set up in the affected area that continuously spreads the deodorizer throughout the room, making sure every surface in the room is reached. This type of odor intervention is almost always overkill for odors found only in the carpeting. If even this isn’t enough it might be time to literally change the molecules in the air. Setting up an ozone machine is the most drastic odor intervention available, and is by far the most dangerous. An ozone machine removes the odor from the air by electrifying the oxygen molecules to add another carbon molecule. Due to this process no one can be in the area for the 24-48 hours that the machine needs to run. Ozone is usually reserved for the worst and hardest-to-remove odors, like smoke and cigarette smells. 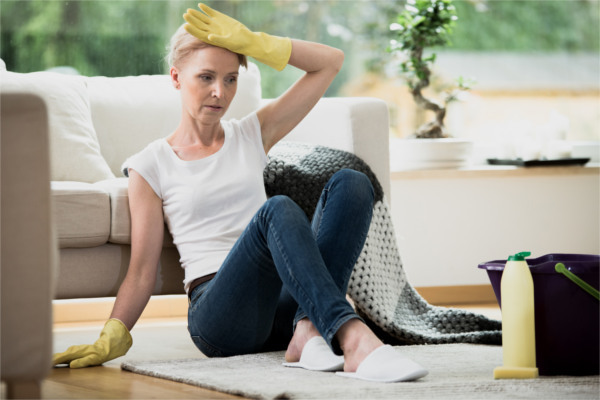 Discovering how severe the odor in your home is key to deciding what step of deodorization is needed, and the cleaning professionals at Modernistic would be glad to evaluate the issues for you. No matter what kind (or severity) of odor you have, you have options on how to get rid of unwanted carpet smells. Rather than replacing an entire room of carpet just because of a pesky carpet odor, trust Modernistic and the different levels of carpet deodorization we offer. We know you’ll love the outcome! We’ve all done it. We found that perfect toy in the pet store that we just KNOW our cat would love to play with. But, when we get it home, our furry feline friend ignores the awesome toy and ends up playing with the box it came in instead. How’s that for gratitude! If you’ve ever thought to yourself “Well I’m not wasting any more money on store-bought, I’m going to make my own homemade cat toys!”, then read on dear reader! Homemade cat toys can be a fun way to personalize your space. You can create toys and furniture for your cat that actually coordinate with your home’s style and color pallet. Plus, you know your cat better than any pet store. Whether your cat likes climbing up high, batting around pieces of trash, or is into the hard stuff (catnip), you can create something personalized your cat will love. Making pompoms is easy and fun! Buy some yarn in colors that you like, and make a bunch of little puffy balls. You can toss them on the floor for free play or tie them onto a dowel to make a wand toy. Pompoms on a string are great to attach to cat furniture to make them more engaging for your cat. Have an unmatched sock after doing laundry? 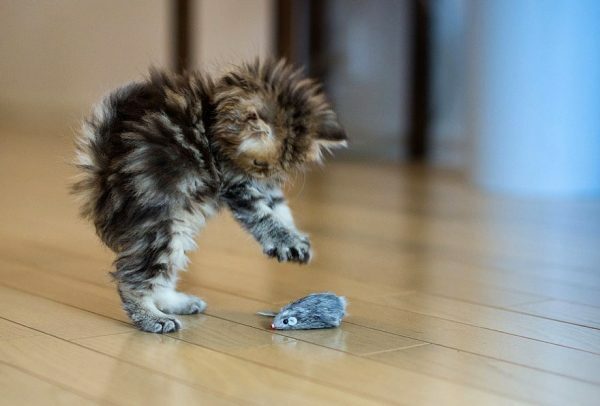 You can turn it into a cat toy! Fill it up with catnip, tie off or sew up the ends, and yours cats will thank you for it! Even just tying an old sock in the middle makes for a simple and fun cat toy she will love to scratch and bite at. You can use a step stool or full size ladder to make a lounging spot for your cat. Use carpeting to make soft and scratchable surfaces. Use an old t-shirt or fleece in the pattern of your choice to create a hammock. Paint the wood to match your interior design. Wrap some of the wooden legs with rope for your cat to scratch. And, you might like to add some fun pompoms on strings for your cat to play with. 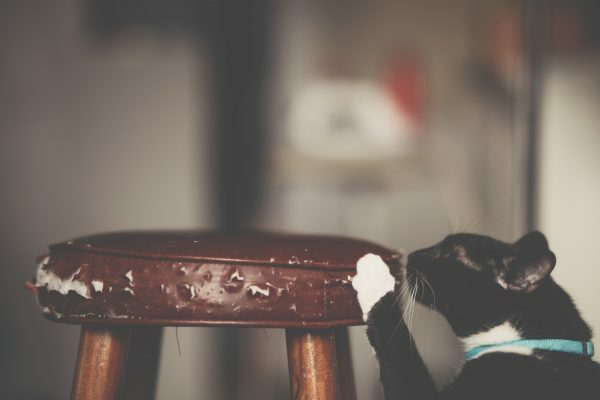 Keeping your cat engaged, giving her a place to feel comfortable, and designated scratching posts will help prevent your cat for scratching where she shouldn’t. Giving her a place up high to retreat can keep her from hiding. These cat toys and furniture will bring joy to your cat, and allow you to customize them to your home’s decor. You will certainly save some money too! 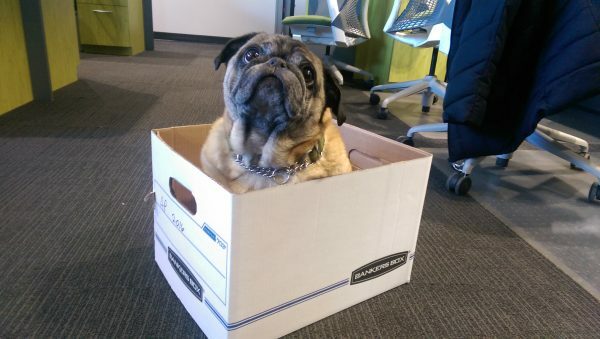 We love our pets here at Modernistic, but we don’t have to love their odors and messes they leave behind. Trust the experts with over 45 years of experience removing pet spots and smells! Call or click today! Dog food and treats can get really expensive, and who knows what mystery ingredients are in those brown little bits? Luckily, there are many easy ways to make your own homemade dog treats! And as an added bonus, even if you add a little too much flour to your treats or leave them in the oven a little too long, your dog will never complain! Fruits & Vegetables: Avocado, Apple seeds, Persimmon, Peach, and Plum Pits, Grapes & Raisins, Onions & Chives, Garlic, Corn on the Cob, Rhubarb & Tomato Leaves. Animal Products: Raw Meat, Fat trimmings, Liver, Milk & Cheese (not dangerous, but can cause digestive distress in some dogs), Fish, Cat Food, and Cooked Bones. Other Foods: Salt, Sugar, Xylitol, Candy, Chewing Gum, Toothpaste, Mouthwash, Tobacco, Alcohol, Hops (Beer), Marijuana, Yeast, and Macadamia Nuts. From that list, you can see how feeding dogs human leftovers could be problematic! I can’t think of a meal I’ve eaten lately that didn’t have Salt, Sugar, or Onions. Below are some simple recipe ideas for homemade dog treats that are sure to get your pup drooling… more than normal… wait, is that a good thing? Puree 2 cored apples with 1 cup Greek nonfat plain yogurt and water, Freeze in ice cube tray, and serve as a naturally sweet and healthy snack. Makes about 2 trays worth of cubes. Blend 1 cups cooked chicken, 1/2 cup cooked rice, 1 cup chicken stock (ideally homemade unsalted), 1 tablespoon parsley, freeze in ice cube tray, and serve as a savory protein packed snack. Cut sweet potatoes into fries/wedges and bake on parchment at 425F for about 30 min, flipping halfway through the cooking. These things are tasty enough for humans to enjoy! Mix two cups flour, 1/2 cups peanut butter, 2 eggs, and a little bit of water. Cut using cookie cutters or knife, and bake at 350F for 20 min. Think of making this in conjunction with your weekly human meal prep. You will need. 1 1/5 cups brown rice, 1 tablespoon olive oil, 3 pounds ground turkey, 3 cups fresh spinach, chopped, 2 carrots, shredded, 1 zucchini, shredded, and 1/2 cup peas. Boil your rice and set aside. Cook turkey in a pan with olive oil for 3-5 minutes crumbling, then add the veggies and cook another 3-5 min. Mix in rice, cook, and serve in 1 cup portions. Speak with your veterinarian about your dog’s dietary needs, and you can create recipes for your own homemade dog treats! Your furry friend will love you for it – I mean, more than he already does! Pet owners have trusted Modernistic to help keep their homes spot and odor free for over 45 years! 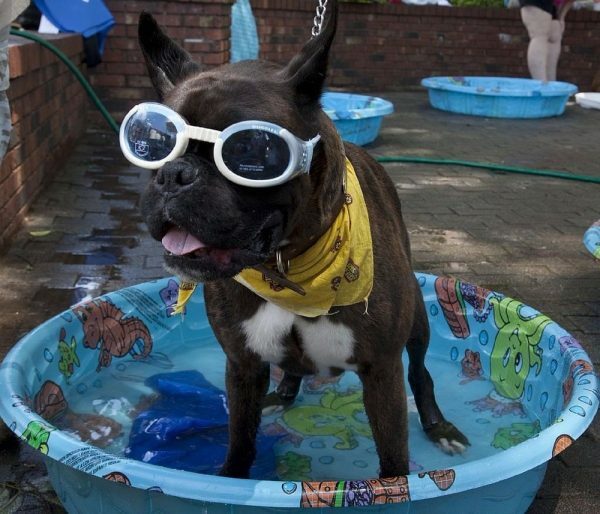 We all know that accidents happen, which is why you should trust the pet spot removal experts! How can Charlotte, MI cat owners keep their houses clean? Cat’s may have a reputation for aloof behavior, but if you’re a cat person, you know what rewarding companions cats can be. But that’s only when your cat is happy, and as any cat owner can tell you, successful litter training is an important part of keeping you and your cat happy, and your house clean. Fortunately, it’s not hard to housetrain your cat, because cats prefer a clean living space almost as much as you do. 1. Have the litter tray ready. Purchase a litter pan and kitty litter from a pet store and have it ready when you bring home your feline friend. Carry the kitty to the litter pan and set it down right inside. Adult cats usually get the hint right away and will seek out the litter box when they need it. Kittens will also want to use the pan, but they may have trouble remembering how to find it, so it’s best to block off part of the house for them and until they can find it reliably. Importantly, don’t move the litter box without helping your cat find its new location. 2. Where should I put the litter box? Make sure your cat can access the litter box easily. Cats like a little privacy when they’re doing their business, but they also don’t like to feel trapped. A low-traffic area of your home is best, but a closet or tight corner is likely to make a cat feel trapped. Also keep in mind that noises from the dryer, furnace, or other appliance can make a cat nervous. It’s best to avoid these areas, because your cat will probably avoid them anyway. And remember: cats often don’t like to share. So if you have more than one cat, place multiple litter boxes in different places around the house. Cats like clean, so it’s important to clean out the litter box regularly. If you can smell your cat’s waste, you can be sure your cat can smell it, too—and your cat may eliminate in a different, cleaner part of the house. Scoop out solids and dispose of them daily, and change the clay litter about twice a week. When you change the litter, wash the box with a mild detergent. This will cut down on the odors in your home, to the relief of both you and your cat. Not all accidents are accidental. If male cats aren’t neutered, they may spray around the house to mark their territory. If your cat quits using the litter box, call your veterinarian, as this behavior often signals a problem. Your veterinarian can help your cat, but who’s going to help your carpet? Blot up what you can and contact Modernistic. 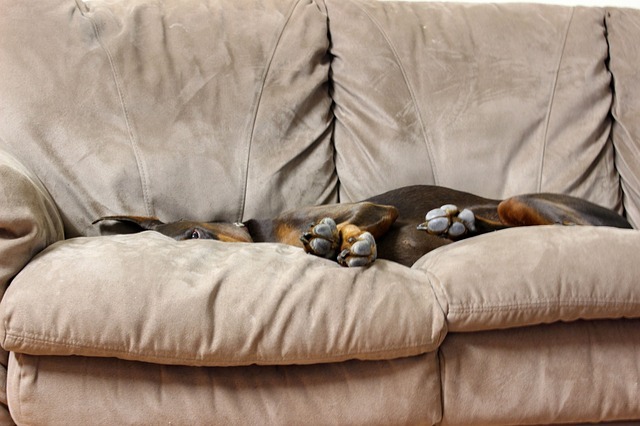 Our professional pet stain removal team will clean and flush the area, using a powerful pre-treatment process and a hot-water extraction system to clear out any evidence of an accident. When your house is clean, your cat will be happy—and so will you.